The Tarpon Toad is a a modern classic tarpon fly that sure has made its mark in a variety of situations. This is a must-have fly for spooky fish and laid-up tarpon in a variety of locations - this fly is excellent in both open water and backcountry situations. 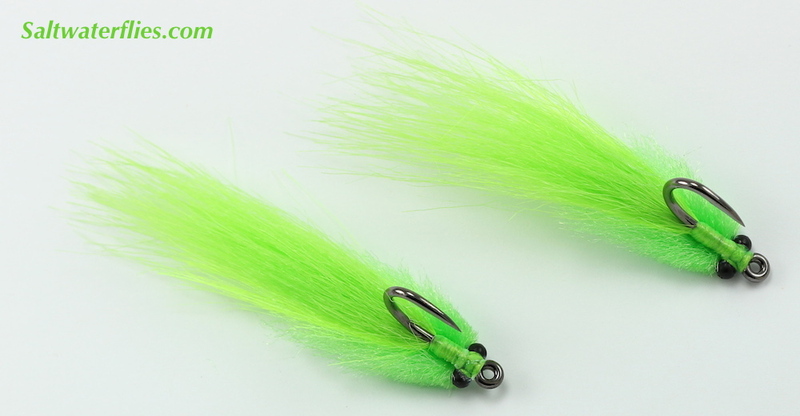 Soft fur tail undulates in the water - subtle color highlights make it easier for the angler to see and track the fly. We have offered a variety of toad flies over the years - this updated version features a bead chain eye instead of a plastic eye, and a stronger hook, making it a versatile fly that hooks and holds fish well. Chartreuse color (side view) shown above - see below for other colors / alternate views. These excellent Toad flies are tied on extra strong #1/0 hooks. These Toad flies measure just a bit over 3 inches (8 cm) long.This fly is tied in the USA by Taylor Topliffe.